Tacos are divine, let’s get that straight out of the way. But, made in the traditional way with corn/wheat shells they are fully loaded with carbs. A single taco isn’t going to set you back on gaining health, though it doesn’t help either – and it is truly difficult to eat just one. If you are already familiar with a Paleo lifestyle, then making recipe switches to keto-friendly ones is a no-brainer. The cilantro-lime vinaigrette to top your taco salad with, contains a special ingredient: olive oil. You are going to be using it liberally on a keto diet, so make sure to buy the top of the line, and this is a case when the most expensive actually is the best. Go for the extra-virgin olive oil when you have the chance as it is an unrefined oil (leaves all the antioxidants intact) and it is not treated with chemicals like the lower grades of olive oil. It should contain no more than 1% oleic acid, have a distinct flavor and most likely will have a greenish tint. One avocado is already present in this taco salad, yet there is always the possibility to add more – and we highly recommend working it in the keto taco salad by the way of a quick and easy guacamole. For more mouthwatering taco inspiration you could also indulge in a taco-stuffed avocado full of all the familiar spices that make tacos so irresistibly great. Heat coconut oil in a skillet over high heat, add the onion and the ground beef. Cook until the beef is browned, sprinkle with the taco seasoning, and cook stirring until well mixed. In a bowl combine all the ingredients for the vinaigrette and whisk until well emulsified. 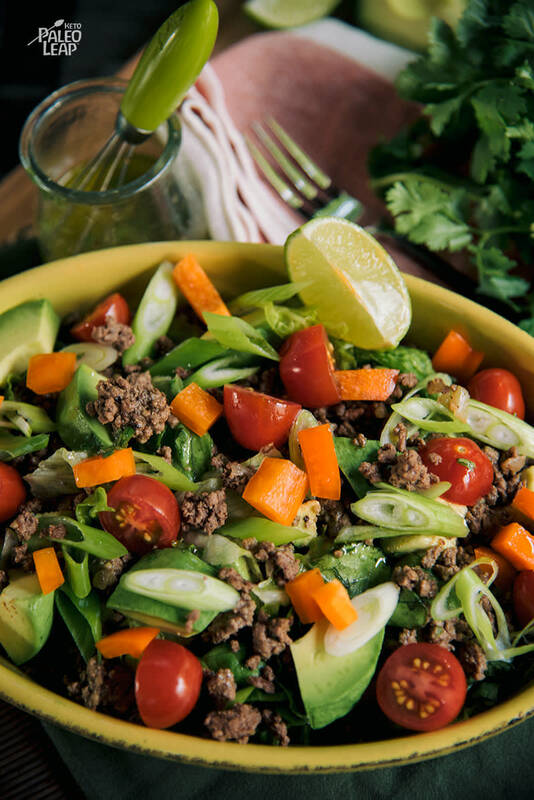 In a salad bowl, toss together the lettuce, tomatoes, bell pepper, avocado, green onion, and ground beef. Drizzle with the vinaigrette, give everything another toss and serve.